The Ministry of Energy has encouraged the general public to adopt solar energy technology as an alternative means of generating electricity since renewable energy is clean, same and cheap. It observed that clean energy sources such as solar, biomas and wind were fast becoming the centre of attraction across the world in delivering sustainable energy supply because they were more efficient, environmentally friendly and cost effective in the long run. "It is presently cheaper to generate electricity from solar than most of the thermal sources in the country," the Director in charge of Renewable and Alternative Energy at the Ministry, Mr. Wisdom Ahiataku-Togobo, told the Daily Graphic at a seminar in Accra. The event was to introduce a new technology to members of the Ghana Institution of Energy (GHIE) and other stakeholders in the renewable energy industry. The technology, PV solar inverter, is suitable for converting direct current (DC) from a solar panel into alternating current (AC) that is used by consumers. It is an innovation of KACO New Energy, a German manufacturer. It is being introduced in partnership with Deng Ghana Limited, to help accelerate the adoption of renewable energy sources in Ghana. The Technical Sales Manager of KACO New Energy, Mr. Dahood Adegbite, said the technology facilitated the reduction of CO2 emission that was released into the atmosphere. 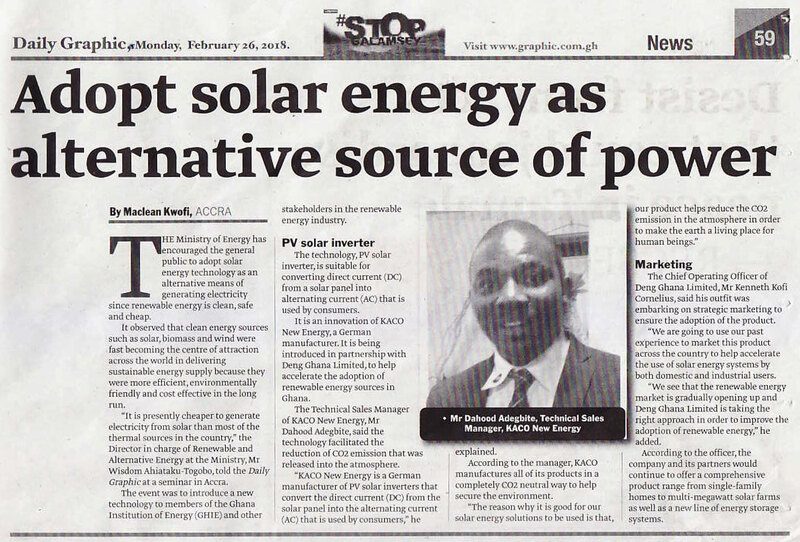 "KACO New Energy is a German manufacturer of PV solar inverters that convert the direct current (DC) from the solar panel into the alternating current (AC) that is used by consumers," he explained. According to the manager, KACO manufactures all of its products in a completely CO2 neutral way to help secure the environment. "The reason why it is good for our solar energy solutions to be used is that, our product helps reduce the CO2 emission in the atmosphere in order to make the earth a living place for human beings." The Chief Operating Office of Deng Ghana Limited, Mr. Kenneth Kofi Cornelius, said his outfit was embarking on strategic marketing to ensure the adoption of the product. "We are going to use our past experience to market this product across the country to help accelerate the use of solar energy systems by both domestic and industrial users." "We see that the renewable energy market is gradually opening up and Deng Ghana Limited is taking the right approach in order to improve the adoption of renewable energy," he added. According to the officer, the company and its partners would continue to offer a comprehensive product range from single-family homes to multi-megawatt solar farms as well as a new line of energy storage systems.